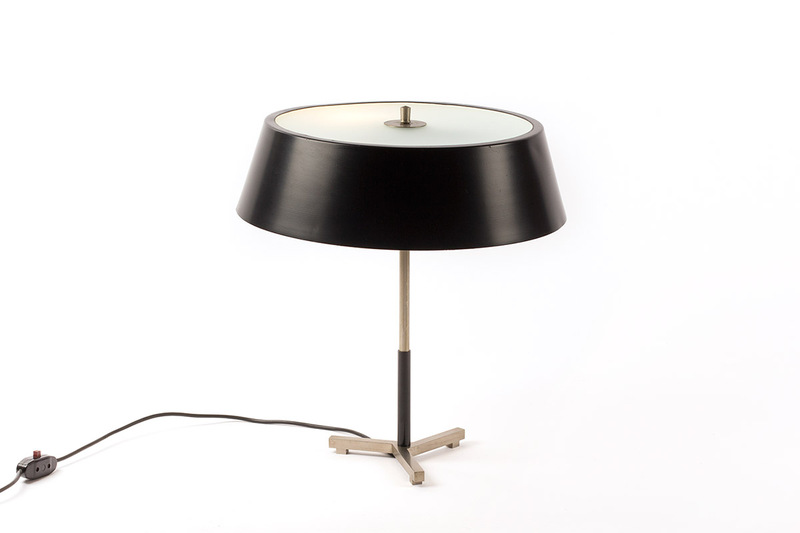 This very rare Dutch design table lamp or desk lamp was produced by Artiforte and probably designed by H. Fillekes. Artiforte was a lamp producer in Rotterdam the Netherlands which is best known for the Magneto floor lamp and the K46 floorlamp designed by Kho Liang Ie. The striking design of the elegant nickel base and stem, the black shade and the frosted glass diffusor make it a very attractive and stylish lamp. It is in a good and clean condition with a few small signs of use, it has the original lacquer and all 3 light sockets original too. Just a truly unique and rare hard to find Dutch design lamp. Dimensions: 43 cm high, diameter of the shade is 39 cm. The price of this beautiful table lamp is 575 euro.